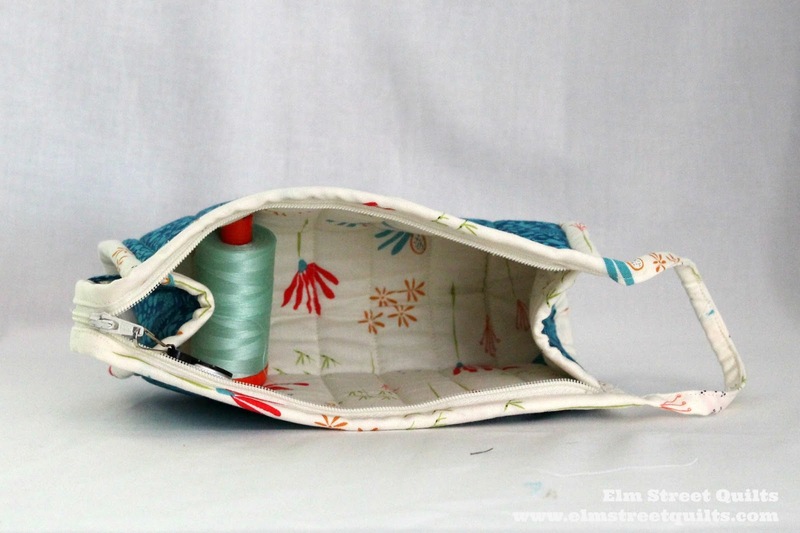 Have you been sewing along and sharing your bags? 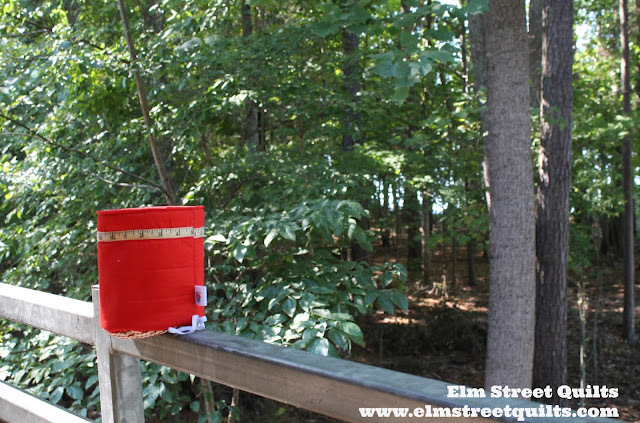 Well over 40 bags have been shared so far in the link-up and in the Elm Street Quilts Facebook Group. You can find the link-up here and it will pop-up in a blog post on a regular basis - keep scrolling! I am really enjoying seeing bags that everyone is making and a few new bag patterns have found their way onto my make list. Did you catch the tips and tutorials post on Monday? I think you will find some help and inspiration there! 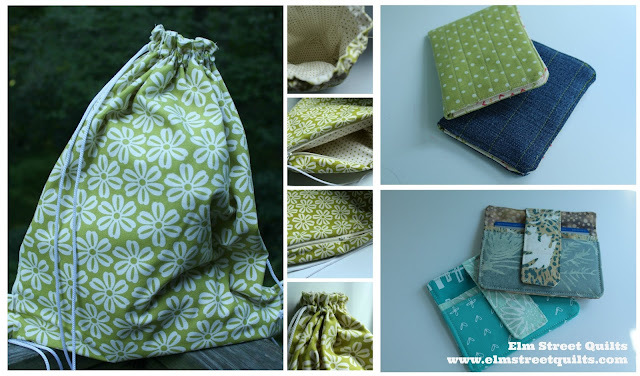 Next Monday, we'll kick off with a new tutorial as we focus on bags for your sewing studio. One more look at my fun new bag which may or may not be a gift but until it is gifted, I can enjoy looking at it, right? Bag pattern from byAnnie and thread by Aurifil - both are sponsors of Bag It. I'll be linking my finished bag at Freemotion by the River, WIP Wednesday's, Let's Bee Social, Midweek Makers. Needle and Thread Thursdays, Finish it Up Friday and Finished or Not Friday. 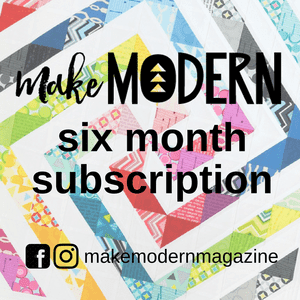 Who wouldn't like a box of fabric in the mail each month? I was so excited when my package arrived from Cotton Cuts that I couldn't wait to see what was inside. Everything is packaged so pretty and I wanted to push all current project aside to start playing with all these new fabrics. A stack of FQ awesomeness. I love the little extras that come in the box too. There are collectible cards with block tutorials plus a free pattern available for download from a designer of the month - love Rachel's work. And isn't this cute? A zipper charm! And these fun set of cute quilty sayings on fabric. Cotton Cuts call these extra surprises a Lagniappe which means 'something extra'. Cotton Cuts delivers fabric each month to your door - fabric customized to what you like. You can choose from their Classics box or their Moderns box and then you set up your preferences profile to indicate what kind of fabric you like and don't like. As an additional bonus, you get 25% off any fabric from their fabric shop. Interested? Want some awesomeness for yourself? Besides the awesomeness in the box, I really, really like their mission to create jobs by providing employment to people with disabilities through their partnership with a sheltered workshop. As a parent of an adult with a disability, I think is just amazing. I just love what they are doing to bring purpose to the lives of these adults. 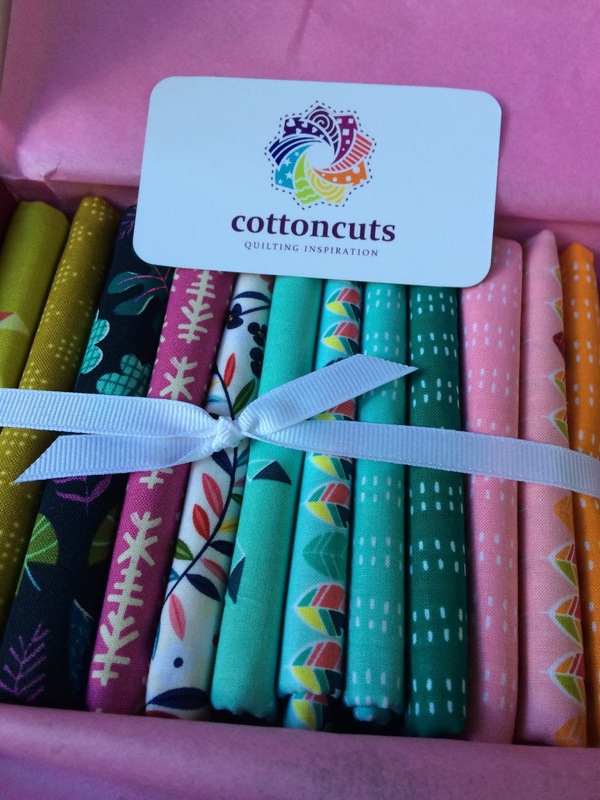 Cotton Cuts sent me a complementary box (which arrived on my birthday!) so I could see for myself what their product is all about. I was already a fan of Cotton Cuts because of their mission statement. The box of awesomeness that arrived in my mail just confirms what I already knew - Cotton Cuts is something special. Take a minute and visit their site - don't forget to use ELMSTREET to save 10% on membership. Now to play with some fabric! I'm excited by all the bags already being shared in the link-up and in the Facebook group. 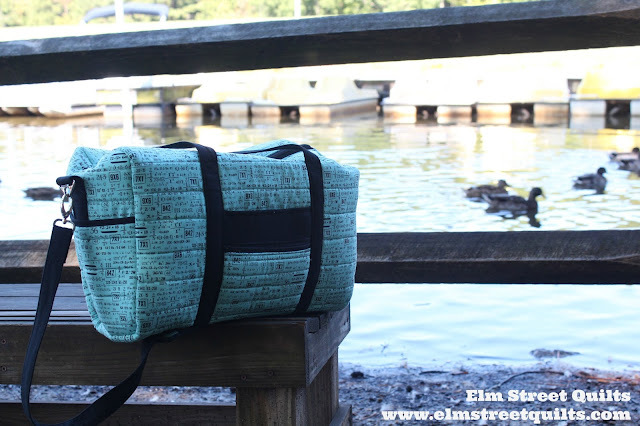 You can share any bag that you make, from any pattern or tutorial, as long as it was made during from September 18 through December 15, 2017. New to Bag It and want to learn more? See the main event page! You can make all kinds of bags once you tackle zippers and the basics of 3D sewing. Check out the basics of zippers to get you started. Then start playing with sizes and shapes of the basic Zip Pouch, boxing corners and the Triangle pouch. There are plenty of great bags you can make that don't involve zippers of any kind. 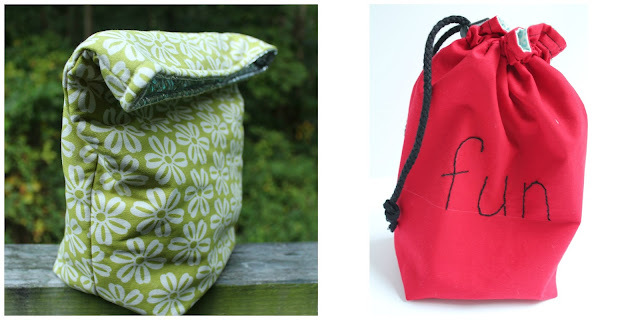 Everyone can use a new lunch sack or a fabric storage bag. What about a game piece bag to fill up with game pieces (Scrabble, anyone?) or just about anything else. Looking for practical bags that make great gifts for just about anyone? I love this drawstring backpack complete with a hidden pocket. Have credit cards that need to stay organized? Either the purse pack or the credit card carrier will do the trick! All three of these are available as downloadable patterns in my shop. Grommets and magnetic snaps are easy to install. Check out these tutorials here and here. Sew Sweetness has a great collection of tips and tutorials. By Annie has videos that cover many of the steps of her bag making. Learn some new techniques to add some polish to your bags. Have a tutorial or tip to share? Leave it in the comments! Now let's get sewing. I'll be back next Monday with a brand new tutorial as we kick-off October and Bags for your Sewing Space! Ready to link-up your September finishes? And don't panic, link-up is open until 11:55 pm EDT on September 30! My goal for September was to assemble my blocks into a quilt top and make the back. Double bonus points to me - I got the whole darn thing quilted and bound! The full quilt reveal will come October 1 (in association with a blog QAL) but for now, here is a photo of the back. I had SO much fun with the FMQing! The back is fun to look at because you can see lots of that quilting texture. This quilt photo was taken at the NC Museum of Art in front of an outdoor sculpture. Now it is your turn to link up - share your goal finish for September. Please only link up if you finished your goal and if you also participated in the September Goal Setting Link-up. Clothworks is offering a Twilight Laurel Burch Basic 2.5'' strip roll and Sam Hunter from Hunter's Design Studio, this month's featured designer, is offering three (3) pdf patterns of the winner's choice. Congratulations to Rhonda, Kathryn & Sherry. Winners were notified by email and have claimed their prizes. 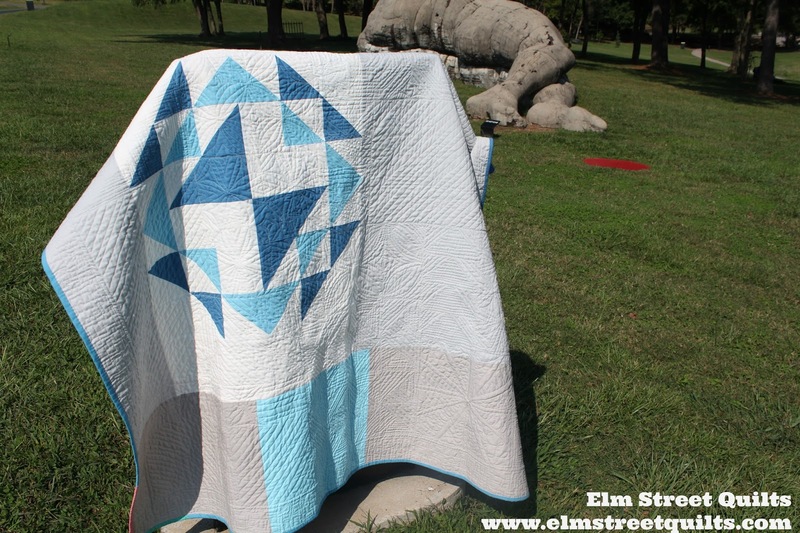 I love participating in QALs and often downsize the instructions to make a smaller quilt. For Cheryl's Magnolia Mystery, I decided to use the instructions for the lap size quilt and make the blocks smaller. Instructions call for HST which are 2 1/2 '' unfinished or 2'' finished. To downsize, I cut the finished size in half to create 1'' finished HST (small, yes) and then add back in the 1/2'' for seam allowance to create a 1 1/2'' unfinished. 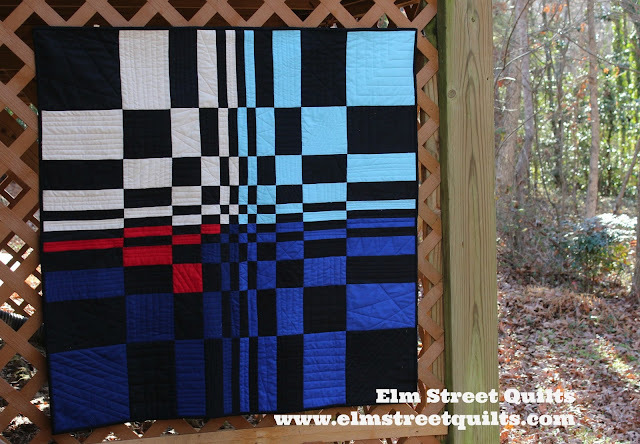 The gray and navy shown in the upper left are the other two colors in the quilt. I'll be doing something similar with Yvonne's Wayward Transparency quilt. Fabric requirements were just released and I'm looking forward to the cutting instructions in October. As a color way, I'm thinking about using several shades of American Made Brand Solids. I can't seem to take a picture, though, that shows the contrast to share in today's post. Think shades of aqua. But before I commit, I think a trip to my LQS is in order. Finally I'm going to also try Mellissa's Roundabout. I'm making a 2 x 2 quilt and think it will be fun in these colors. I've got my fabrics cut and ready to link-up. I am doing a 4 block size (in a 2x2 layout). I've got the fabrics required for each block plus background clipped together. Different color palette for me and I'm looking forward to it. 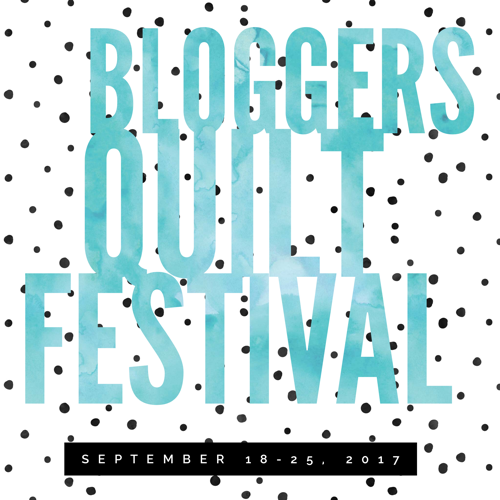 Amy is back with this year's Blogger's Quilt Festival. 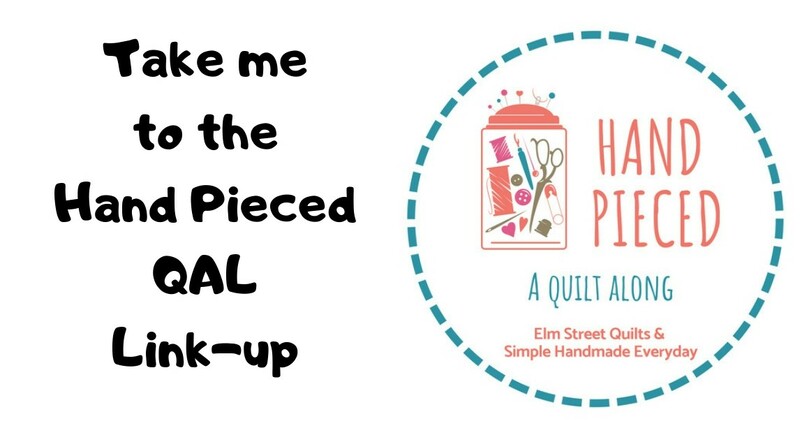 Every year Amy hosts a wonderful link-up where quilters can link-up two of their favorite quilts in a virtual quilt show. It is so much fun to see what everyone is doing and visit new blogs. 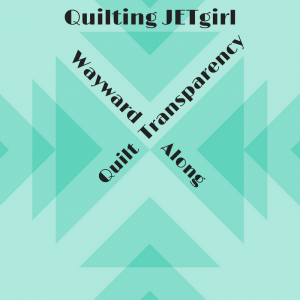 My first entry is my quilt Playful which I posted about yesterday. Today, I wanted to share my wall-hanging quilt called Numbers. The quilt is a Fibonacci quilt. The dimensions of the blocks are part of the Fibonacci series (1, 1, 2, 3, 5 ...). For the quilting, each block is quilted differently in matching thread. The number of quilting lines crossing the block also maps to a number in the series. The quilt finishes at 40'' square and the fabrics are all American Made Brand solids. My son is a math and computer geek and this quilt was perfect for him. It hangs on his apartment wall and I get to see it each weekend when we Skype. If you a new visitor to my blog, welcome! I hope you'll stick around a bit and visit. I've some fun things going on right now. 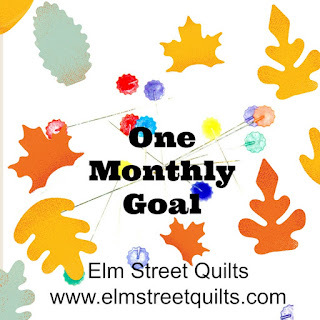 One Monthly Goal is a monthly link-up party where you declare you sewing goal for the month. This could be to create a few blocks, add on a binding - whatever it takes to make progress on your sewing projects. You can read more about it here - come link up in October! The 3rd annual Elm Street Quilts Bag It event just began. There will be 3 months of fun including tutorials and designers spotlights on various bags to encourage handmade for the holidays. Making a bag - any bag, doesn't have to be from my tutorials - earns you entries to win some absolutely fabulous prizes from sponsors. Don't miss this event - help me spread the word - tell your friends! My first entry is my quilt Playful which I finished recently. 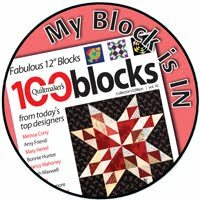 The quilt used 75 of the 100 blocks I made as part of this years #100Days100Blocks2017 Instagram based challenge. When I started making the blocks, I had no plan in mind for the quilt. But my daughter saw otherwise. She spent time this summer painting her room a pretty shade of gray. So she claimed the quilt when there were only a few blocks sewn. She regularly (and enthusiastically) checked on my progress in pulling the quilt together. She hoped to get the quilt on her bed before she had to head back to college for her sophomore year. I got it done with about a week to spare. We took it to our local playground for the photo shoot. The solids were American Made Brand solids is several shades of gray. The blocks themselves were from a FQ bundle of Pastel Pop by Michael Miller. I had fun using yellow - not a color I sew with very often. Some of the blocks have really sweet elephants in them. The remaining 25 blocks will very likely end up as a pillow(s). When you are ready to share on Instagram or from your blog, link-up a photo to claim your Bag It Entry. 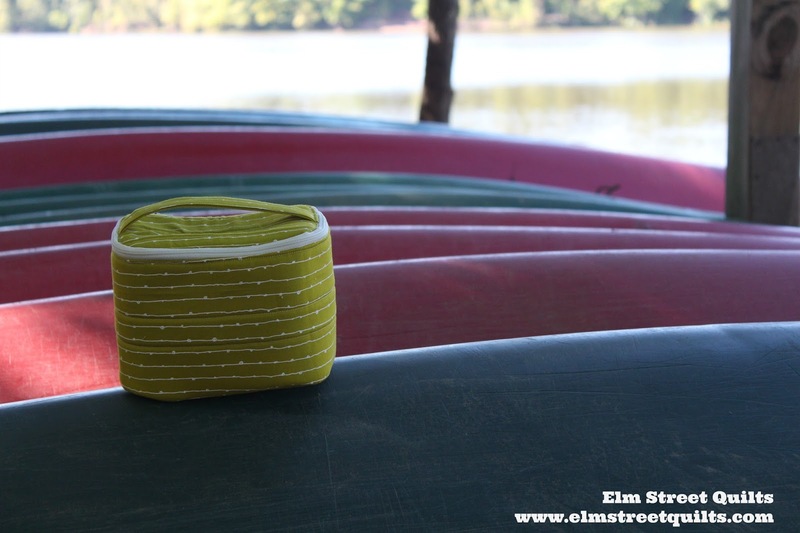 Photos linked from Instagram must contain the tag #elmstreetquiltsBagIt. 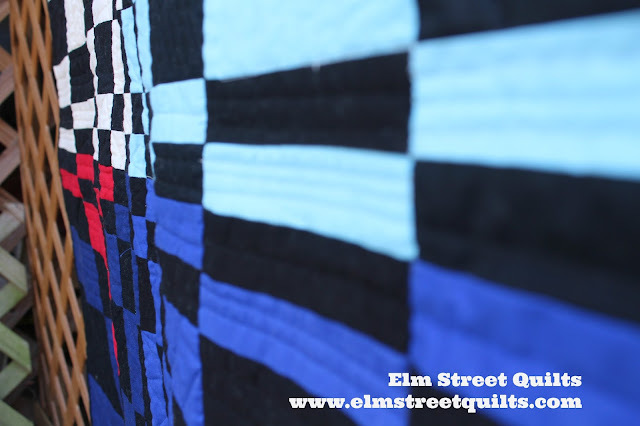 Photos linked from a blog post must contain a link back to Elm Street Quilts. You can share your bags across multiple social platforms but only claim the entry once in either the link-up or in the Facebook entry form. Duplicate entries will be disqualified. 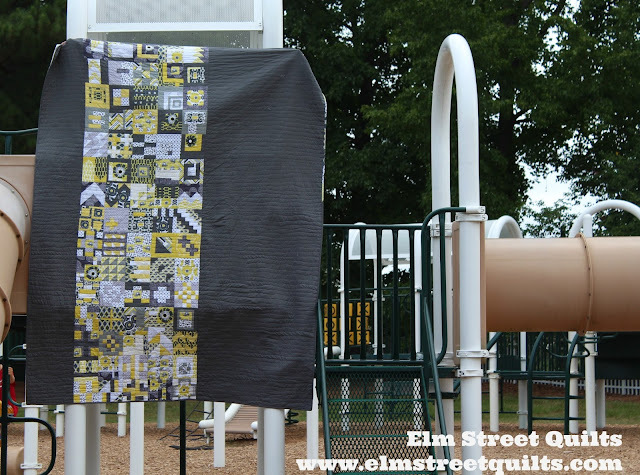 If you don't have a blog and don't use Facebook or Instagram, photos can also be sent via email to elmstreetquilts at gmail dot com. Tips, tutorials and featured designers posts begin on Monday, September 25. See overall schedule and links to all tutorials on the Bag It event page. 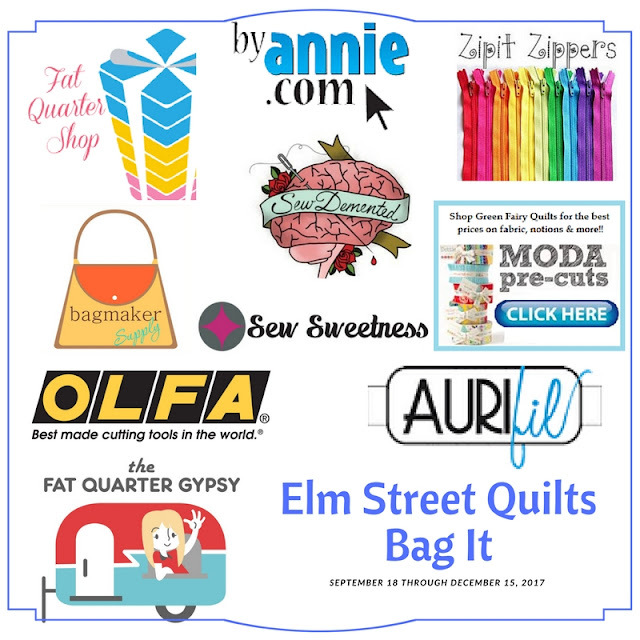 Visit this post to meet Fat Quarter Shop, ZipIt Zippers & OLFA. Visit this post to meet Aurifil, BagMaker Supply & Green Fairy Quilts. Today we will meet our four featured designers from byAnnie, SewDemented, Sew Sweetness and Fat Quarter Gypsy. I am thrilled this year to have these four amazing bag designers support the Bag It 2017 event. I'll be sharing more about them, their companies and their work in future posts. Today, let's do a quick introduction and share of the prizes they have generously provided to lucky participants. I've made bags designed by Annie, Joanne, Michelle and Sara and just can't wait to share! Support from each of the fantastic sponsors kicks the fun up a notch offering added incentive to play along. 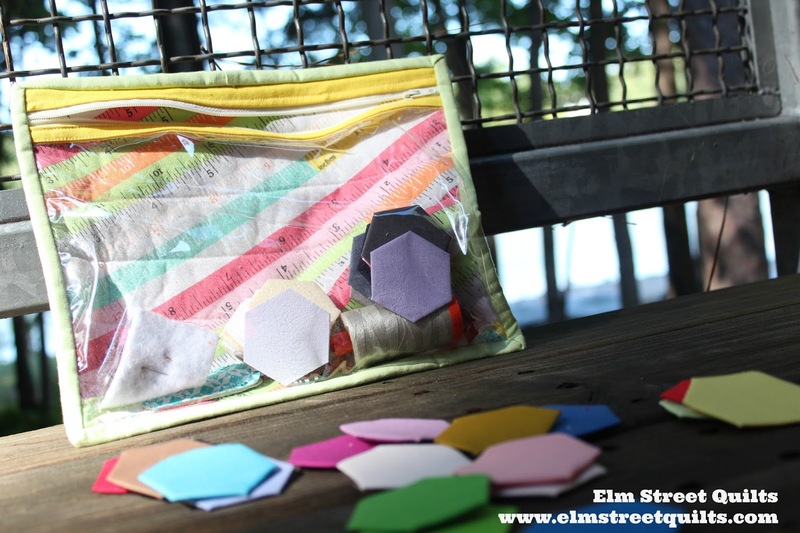 Visit Monday's post to meet Fat Quarter Shop, ZipIt Zippers and OLFA. Visit Tuesday's post to meet Aurifil, BagMaker Supply and Green Fairy Quilts. ByAnnie.com is your online source for patterns and supplies for quilters, decorators, fabric lovers and other crafters. The Soft and Stable product provides body and stability for bags and was used in several of the bags featured this year. byAnnie is offering a $25 gift certificate to two lucky participants. I'll share more about byAnnie on November 27. Until then, please visit Annie on her website, on Facebook and on Instagram. SewDemented™ is the company behind the extremely popular Sew Together Bag and other popular patterns. SewDemented™ is offering a pattern of the Sew Together Bag plus a starter fabric pack to one lucky participant and a pattern of their choice to another lucky participant. I'll share more about SewDemented on October 23. Until then, please visit Michelle at SewDemented™ on her website SewDemented.com and on Instagram. Sew Sweetness offers a wonderful collection of bag patterns including backpacks, train cases and duffel bags. New this year is a series of videos to help the bag maker through every step of the bag making process. 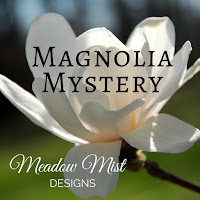 Sew Sweetness is offering a $40 gift certificate to her pattern store to one lucky participant. I'll share more about Sew Sweetness on November 6. Until then, please visit Sara at Sew Sweetness on her website SewSweetness.com, on Facebook and on Instagram. Fat Quarter Gypsy designed the Fat Quarter Pop-up, a collapabile container which became an instant hit. Her shop caries a fun line of Dress Up Your Pop-up patterns plus her latest pattern called the Wingman. Fat Quarter Gypsy is giving away a package of patterns to make a small pop-up, a medium pop-op plus her latest pattern The Wingman. 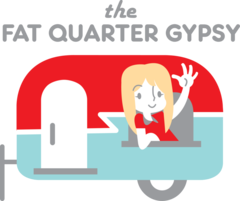 I'll share more about Fat Quarter Gypsy on October 9. Until then, please visit Joanne at her shop FatQuarterGypsyshop.com, on Facebook and on Instagram. 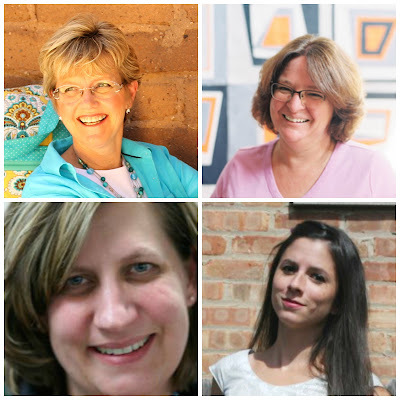 Thank you Annie, Joanne, Michelle and Sara!